Schaeffler UK provides information on the advantages of reconditioning large industrial rolling bearings instead of replacing them. By reconditioning large rolling bearings rather than direct replacement, companies can save time and money, while ensuring that the bearings are restored to an acceptable, functionally reliable condition, says Dave Wall, Senior Applications Engineer at Schaeffler UK. The characteristics and condition of rolling bearings have a significant influence on the overall availability of plant and machinery. However, many rolling bearings are still dismounted and replaced as part of a company’s routine maintenance activities, particularly on machinery that is deemed critical to the production process. In many cases though, bearings can be restored to a completely acceptable, functionally reliable condition using appropriate cleaning and rework techniques. This is particularly true if the bearings are large, where reconditioning or rework can often save valuable time and money. 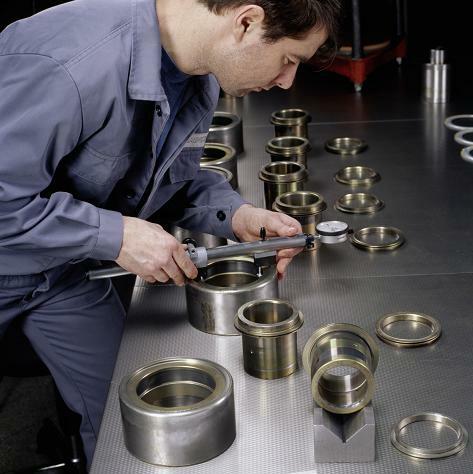 Reconditioning can offer significant advantages in applications such as paper mills, steel and aluminium processing, mining and quarrying, rail and marine, where large rolling bearings often play a critical role in keeping high value production plant, machines, ships and vehicles operating continuously and efficiently around the clock. When considering reconditioning of rolling bearings, you don’t always need to approach the original manufacturer of the bearing. Some bearing suppliers can provide reconditioning services for any bearing product, regardless of the manufacturer. If you already have a good working relationship in place with a particular bearing supplier, it is worth asking if they can recondition other suppliers’ bearings too. In the UK, Schaeffler’s bearing reconditioning service normally involves an initial, free on-site inspection of the bearings in order to determine whether reconditioning is appropriate and possibly viable. This saves any unnecessary transportation and inspection costs being incurred by the customer. An expert from a local Schaeffler Technology Centre in the UK will typically inspect the bearing damage on-site and record this by taking photos, which can be sent to specialists at Schaeffler’s Wuppertal repair centre in Germany. A budget cost for reconditioning can then be provided to the customer, who can then decide whether to proceed with an in-depth damage diagnosis and reconditioning work. The initial on-site inspection allows Schaeffler to offer specialist advice and guidance to the customer on how the life of the bearings can be extended in the future. For example, by using advanced materials or coatings on certain bearing components. On-site visual inspection by trained, experienced engineers can also help to discover other factors that may be causing the bearings to wear prematurely, such as incorrect bearing mounting, inappropriate lubrication or loading conditions. What does reconditioning actually involve? Reconditioning can be applied to all types of rolling bearings, including back-up rollers, radial spherical roller bearings, cylindrical roller and tapered roller bearings. The Service Centre in Wuppertal provides modern production and measurement facilities for the whole of Europe. If certain components cannot be repaired, they are completely replaced. Once the specialists at the Wuppertal repair centre have carried out the appropriate processing, the repaired rolling bearings provide the same performance as new bearings. Reconditioning comprises of appropriate cleaning and disassembly of the bearing, the preparation of comprehensive examination reports, including appropriate repair recommendations and reconditioning proposals for various levels of reconditioning. These range from simple polishing repairs, through grinding and replacement of individual components, to the substitution of a complete inner or outer ring. Depending on the specific reconditioning levels required, the relevant predicted costs and the anticipated duration of repair are calculated. Once the appropriate processing has been carried out, the reconditioned rolling bearings should provide the same performance as new bearings. In certain cases and after careful assessment and damage diagnosis, the customer may even receive the same warranty as for a new bearing. Schaeffler also offers rail operators a reconditioning service for its TAROL range of axlebox bearing units. The repair and periodic maintenance of axlebox bearing units on rail vehicles can significantly extend the life of these very heavily stressed components. As the reconditioning service is rapid, the customer benefits from minimal downtime. The reconditioning itself consists of thorough cleaning of all bearing components, as well as dimensional and functional inspection of the complete bearing unit. The axial clearance is readjusted and the bearings are relubricated. Any worn parts are also replaced. In addition to reconditioning, rolling bearings can also be modified. Examples include the provision of threaded holes, adjustment of bearing clearance or changes to the bore diameter. A rolling bearing from replacement parts stock that is no longer required can be adapted to suit a different purpose. This saves time, material and cost, while still providing the customer with a rolling bearing that is of new quality. Coatings can also be applied in order to improve the characteristics of bearing components. A coating can prevent corrosion, reduce wear or contribute to energy efficiency by decreasing friction. If damage is discovered during examination of the rolling bearing, a request can be submitted for examination and assessment of this damage. The results can be recorded in an assessment report. This means a statistical evaluation of possible defect sources can be carried out. A decision in favour of reconditioning of rolling bearings allows manufacturing companies to make a considerable and ongoing contribution to reducing energy consumption and resources. In the case of defective components, Schaeffler ensures correct separation of materials according to grade. All Schaeffler manufacturing plants and reconditioning locations are certified in accordance with the relevant environmental standards.